Measuring Beaker PP, Autoclavable, 1000 ml., Pack of 6 Pcs. As a trusted manufacturer, exporter and supplier of Plastic Lab Beaker in Mumbai, Maharashtra, India, we meet various requirements of chemistry labs and other research areas. We are successfully meeting the requirements of our clients by trading the best quality range of Plastic Beakers. - Poly lab Beakers, molded in Polypropylene, have excellent clarity and very good chemical resistance. These autoclavable Beakers have prominently raised graduations on the outer surface. Our organization is an eminent provider of Plastic Beaker to our clients. Experts have used ceramic along with plastic for its production. It has calibration which helps in accurate measurement of liquid or fluid level. Capacity: 25 ml, 50 ml, 100 ml, 250 ml, 500 ml, 1000 ml, 2000 ml. Euro Design Plastic Beakers molded in polypropylene have excellent clarity and very good chemical resistance. 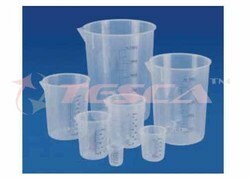 We are prominent names in this domain for offering a wide range of Plastic Beaker. 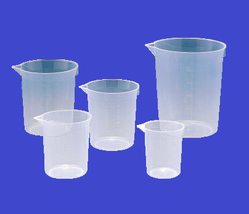 With the years of experience and knowledge, we are engaged in offering a wide range of Laboratory Plasticware. These products are well equipped and ensure long lasting service life. Advanced technologies and modern machines are used while manufacturing these products. We are offering these products at market-leading rates.